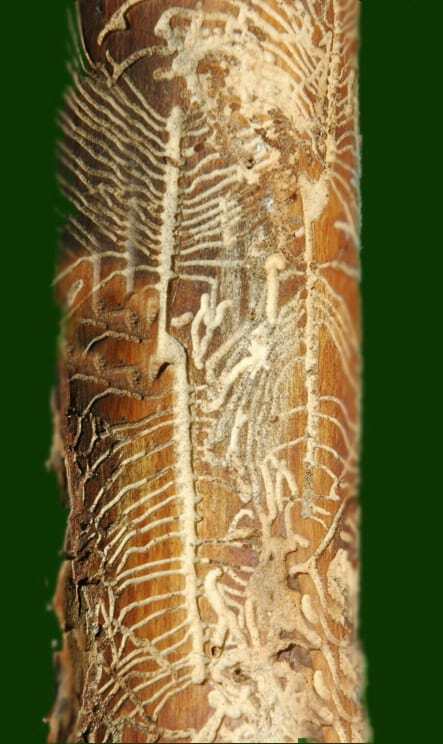 This bark beetle, as others thrives during times of drought and other stresses. The beetles normally attack only weakened juniper trees unless the climate conditions are exceptionally dry. A healthy trees have the ability to produce an abundance of sap to push the burrowing beetle out of its bark at the first sign of infestation, but in times of drought, the trees sap production is seriously compromised so even a healthy tree is at the mercy of the bark beetle. The Larvae are small, white, narrow, short, segmented. Adults are red-brown to black, shiny, ranging from 1/8-3/8 in. long; rows of teeth at rear of front wings; antennae 5-jointed clubs with oblique depressions. Their Egg galleries are short, longitudinal with little or no branching, becoming confused with heavy infestations, arising from single entrance hole; larval chambers extend laterally. All species of Cupressus, Cedrus, Chamaecyparis, Cryptomeria, Cupressus, Juniperus, Libocedrus, Sequoia, Sequoiadendron, Taxodium, and Thuja are hosts. They are found in the throughout the United States and Canada. Poor sites, drought, nutritional deficiencies, wounding, and root impaction all contibute. Twigs yellowing, browning, wilting at tips and hanging; egg and larval galleries immediately under bark; small droplets of pitch below feeding areas on twigs and stems on some species. Host trees usually weak on poor sites or under stress. Trees killed by infestations. Adults attack all upper parts of weak, dying or dead trees, or broken branches. Prior to constructing egg galleries, adults feed on healthy twigs, hollowing them out until they break over. Egg burrows made by adults working in pairs. Eggs uniformly spaced along sides of burrows. Larvae feed laterally from one egg gallery. Attacks in spring and summer, with 1 1/2 generations per year.